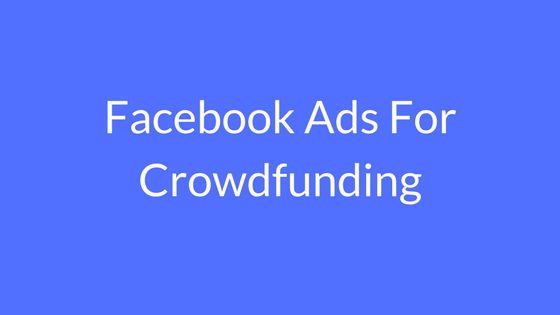 Facebook ads for crowdfunding are usually underestimated when it comes to advertising for crowdfunding campaigns. Facebook ads are vital to the success of crowdfunding campaigns, they can bring you leads, fans and loyal backers. If you are not using Facebook ads for the crowdfunding campaign, you’re missing out on a lot of potential sales. Without a doubt, Facebook ads are the fastest way to attract new backers for your crowdfunding campaigns. Facebook ads can be very profitable and increase your sales by a long way. However, if you don’t know how to use Facebook ads, you are going to be wasting money instead of making money. The purpose of this article is to give you the best tips for using Facebook ads to increase your crowdfunding sales. Your images and videos have to be very creative to capture the attention of the potential backers you are trying to target. Your copywriting is just as important as your visual elements, the words should be able to persuade the potential back to take action. Your audience are the people most likely to take action and actually back your crowdfunding campaign. Finding your segment audience is vital because the whole ad campaign should be shaped around it. The offer you include in your advertising will be the main reason that they will actually click on your ad. Therefore, your offer should stand out clearly in the advertisement and persuade the potential backer to click on your add. Imagery and videos are more appealing to people nowadays. The average attention span of humans is decreasing, therefore, visuals are one of the great ways to grab attention. Facebook Ads for crowdfunding video should be around 30 seconds long. If you don’t have enough money for professional photographers, you can use student photographers.They will cost considerably less and offer great quality photography. You can view our guide to making great videos here. To find the right audience, firstly you need to understand and study your own product. Research your product to find the right target audience that is most likely going to take action and back your project.This is vital because not everyone is going to be interested in purchasing your product. When you get to the stage of narrowing down your target audience, you will be able to determine how you should shape your Facebook Ads to suit your campaign. You should research the market and then see how your competition created their Facebook Ads. Facebook allows you to really narrow down your audience. You can narrow down the audience using different factors, such as location, gender, interests, jobs and so on. Narrowing down your target audience will increase your selling your product and decreases your ad costs. Therefore it is a vital step in any Facebook ad campaign. Another way to find more backers for your project through Facebook ads is to use the lookalike audiences feature. Facebook will create a list of users that have similar attributes to those that you’ve designated. Facebook uses their own and accurate algorithm to do this. Other custom audiences you’ve built. This feature if used correctly can really drive your crowdfunding project to success. You will not get your Facebook ad perfect from the first go. You need to change and tweak it until you get it right. Using Facebook ads you can run tests by spending small amounts of money on different ads to find which one is converting. You can test different ads using different images, copywriting and videos. Facebook allows you to run two different ads at the same time using the same image but with a different copy. This makes it easy for you to analyse to find out which one is popular with your target audience. Once you test your different ads and find the highest converting one, you can stop the others and boost the spending on it. People always want to know how much the price of your product costs and the offer that they will get for clicking on your ad. Including the original price of your product and the percentage they will be getting off has been shown to get people to click on ads. This helps the overall conversion rates and create a better experience for your target audience. The famous phrase “ to make money you have got to spend money” can definitely be applied to your crowdfunding campaign. There are numerous places to advertise your campaign throughout on the internet but there is no place like Facebook. Facebook the highest number user with over 1.7 billion active users around the globe. Facebook ads for crowdfunding allow you to narrow down your audience like no other place can offer. Always make sure to try and test out different ads, because you might think one is converting but when you release a different one it turns out to be performing even better. Using Facebook ads correctly can be one of the most important factors that drive you to exceed your crowdfunding goals. Follow these simple steps mentioned in this article and you will have a successful Facebook Ads campaign for your crowdfunding project. P.S Did you miss our other Facebook blog post? Here’s how to build up your page likes.